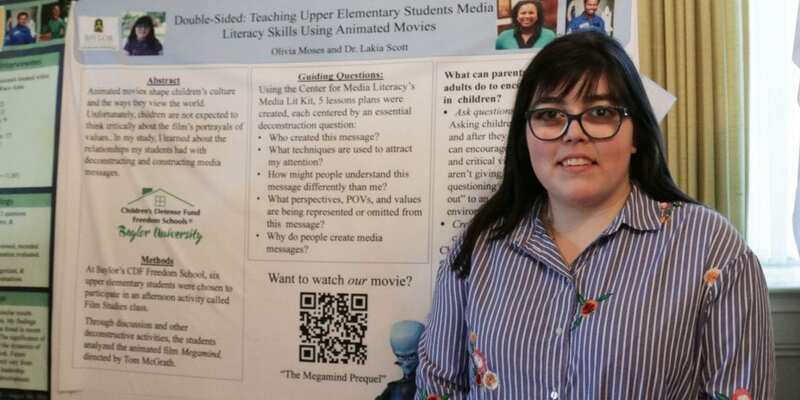 Senior Olivia Moses presented her research on campus during the McNair Scholars Symposium last fall. The McNair Scholars Program is a federally funded program that helps low-income and first-generation undergraduates — as well as students who come from groups underrepresented in graduate education — prepare for the path to doctoral degree programs through a variety of scholarly activities, including immersion in research with a mentor. The program also provides financial planning for graduate school success, summer research internships with stipends, and the opportunity to attend academic conferences. 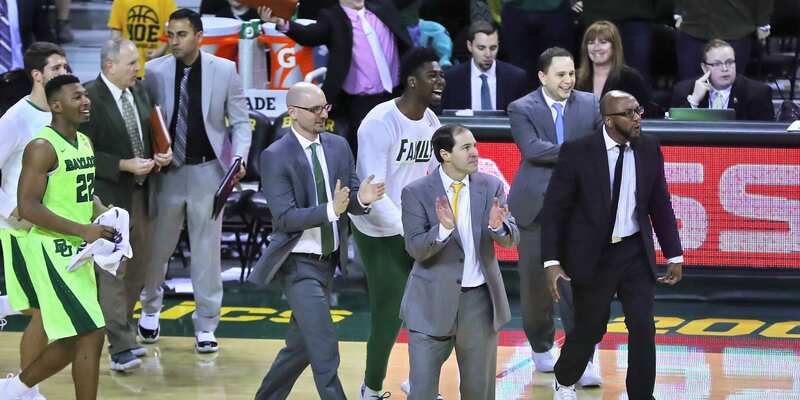 Graduates of the Sport Management Program on the men’s basketball staff are Aditya Malhotra (fourth from left, black shirt), John Jakus (center, gray suit), and Ty Beard (second from right). 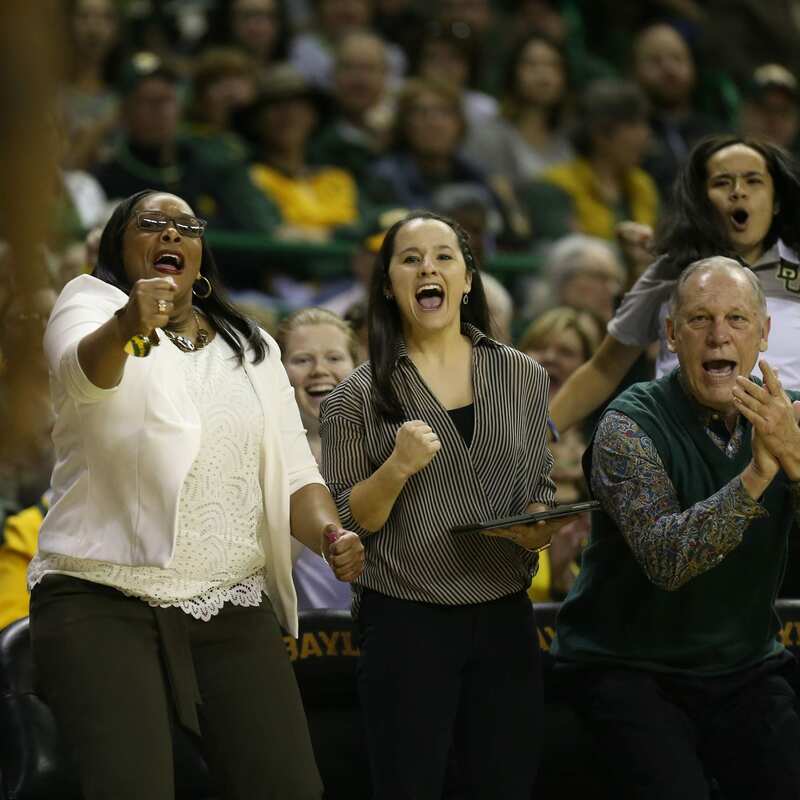 Sport Management graduate Kaylin Rice (center) counts cheering on the sidelines among her duties as Associate Director of Operations for the Lady Bears. While Baylor School of Education is celebrating 100 years, we have another important “100” to celebrate — a 100% pass rate on certification exams by Baylor School of Education graduates! The Baylor School of Education is celebrating its Centennial year of preparing teachers to go into the field of education equipped to make a positive difference in the lives of children, communities, the nation, and our world. As we reflect on the rich history of the Baylor School of Education, we celebrate many accomplishments, and there are certainly many to celebrate. One is the amazing success of the Baylor School of Education graduates on the examinations required to become educators. The Texas State Board of Educator Certification report for the 2017 – 2018 has recently been released. And, once again, teacher education graduates of the Baylor School of Education boast a 100% pass rate on the examinations that are required for preservice teachers to be recommended for certification – 100% for both the content and pedagogy Texas Examinations of Educator Standards (TExES) tests! This is the fifth year in a row that Baylor School of Education graduates can claim a 100% pass rate. 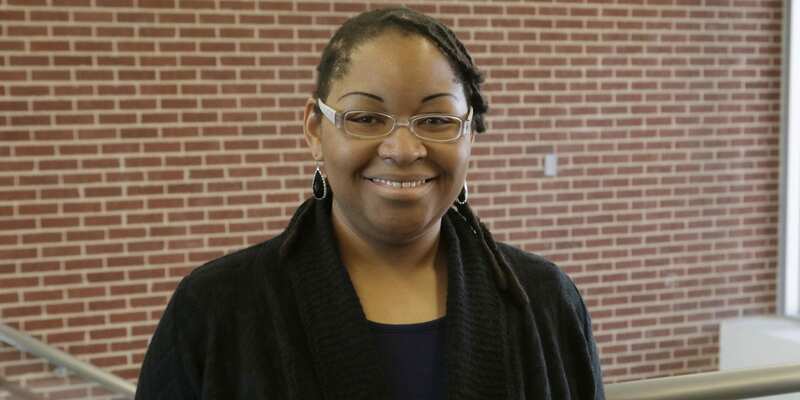 Courtney Jerkins, a student in the EdD in K-12 Educational Leadership program in the Baylor School of Education’s Department of Educational Leadership, is one of two educational leaders statewide to receive a special TASA scholarship. Jerkins, Coordinator of Elementary Science/Social Studies and English Learners for Midway ISD near Waco, will receive the 2019 Johnny L. Veselka Scholarship from the Texas Association of School Administrators (TASA) at the group’s Midwinter Conference Jan. 27-30 in Austin. The scholarship recognizes the leadership of Dr. Johnny L. Veselka, who dedicated nearly 44 years of service to the association, including 32 years as TASA’s executive director. 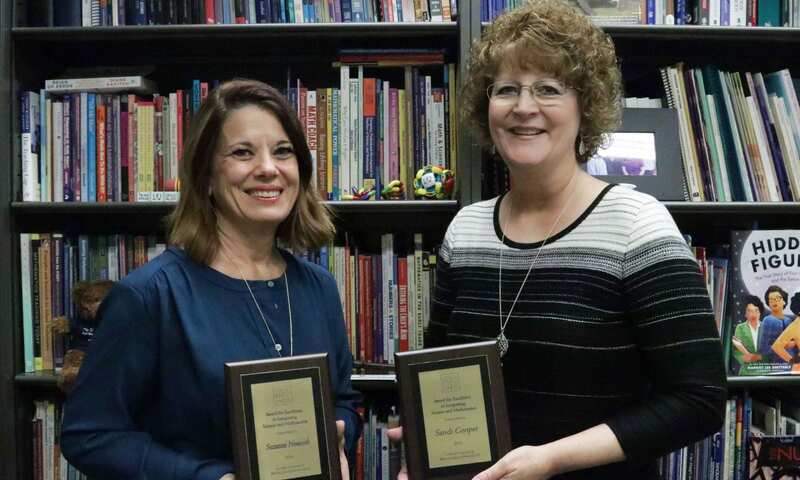 TASA awards the scholarship annually to two outstanding doctoral students pursuing careers in educational leadership, with particular emphasis on the superintendency. School of Education faculty members presented research at the 68th annual conference of the Literacy Research Association, a prominent national conference on literacy studies. The conference was held Nov. 8 – Dec. 1. Dr. Kelly Johnston and Dr. Phil Nichols, both assistant professors in the Dept. of Curriculum & Instruction, presented several research sessions and served in other leadership roles. 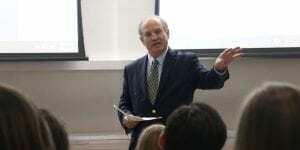 Johnston served as chair of the paper session “The Power of Writing Places and Spaces.” Nichols served as organizer for two of the symposia that he presented papers in. The year 2019 marks the 100th birthday of the Baylor School of Education as a separate academic unit at the University. During this year, numerous events and publications will celebrate the long commitment of Baylor University to K-12 as well as higher education and share a vision for the future. Navigating life with a learning disability may bring various challenges. 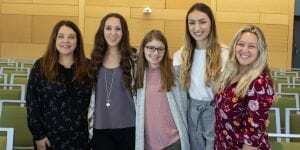 That is why on Thursday, Nov. 29, Baylor University invited 70 students ages 8 to 17 from Goldthwaite Independent School District to campus for a presentation by four Baylor School of Education graduate students about dyslexia and how to thrive despite challenges. 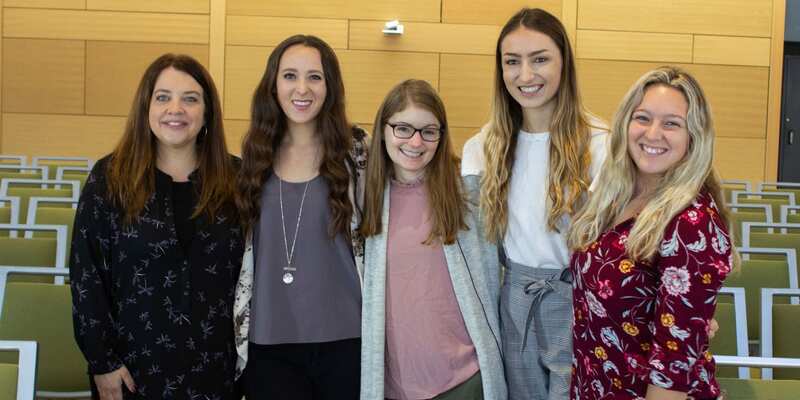 Graduate students Olivia Borba, Stephanie Fritz, Felicity Frost and Ally Yturralde are each working towards an educational specialist degree in school psychology. They are currently working in schools for a practicum, and this event exposed to them to children of all ages with academic struggles. The School Science and Mathematics Association has awarded the Baylor University School of Education and Waco ISD collaborators the Award for Excellence in Integrating Science and Mathematics for highlighting Science, Technology, Engineering and Math (STEM) use in two Waco ISD elementary schools. They received the award at the SSMA convention in October. Sandi Cooper, Ph.D., professor of mathematics education, and Suzanne Nesmith, Ph.D., associate dean and associate professor of science education in curriculum and instruction, approached the principals of Mountainview Elementary and Bell’s Hill Elementary with the idea of working with a small group of teachers to learn the importance of STEM for early learners. The schools wanted to take it a step further and include every teacher on both campuses. The Fall 2018 issue of Baylor Impact is now available online. Check it out for stories about Baylor School of Education students, faculty, alumni and programs. In this issue, you’ll meet the FIRST graduate of the SOE’s PhD in Higher Education Studies & Leadership program, learn about the SOE’s FIRST fully online program, read about an alumna with a Fulbright Scholarship and a new program for rural families of children with autism — plus much, much more! School of Education graduates should have received a printed copy of Impact in the mail. 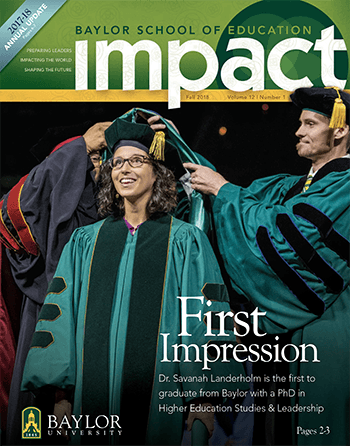 If you are a graduate and did not receive a printed copy, please email BaylorImpact@baylor.edu. Also feel free to email us with any news that the School needs to know! The Honorable Chet Edwards, former U.S. Representative and Baylor’s W.R. Poage Distinguished Chair of Public Service, will present “Education and Education Policy” on Thursday, Nov. 8, from 5 to 5:45 p.m. in room 101 (Packard Auditorium) of Marrs McLean Science Building. The event is sponsored by the School of Education’s Department of Curriculum & Instruction.